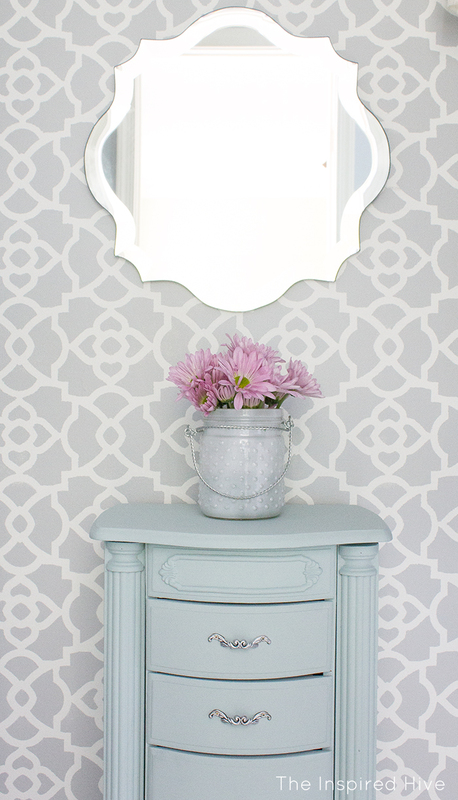 Every time I walk by my dreamy walk-in closet makeover, I am awe struck. I just can't believe that I have such a girly, pretty, glam closet! It was so much fun to work on and so worth it! 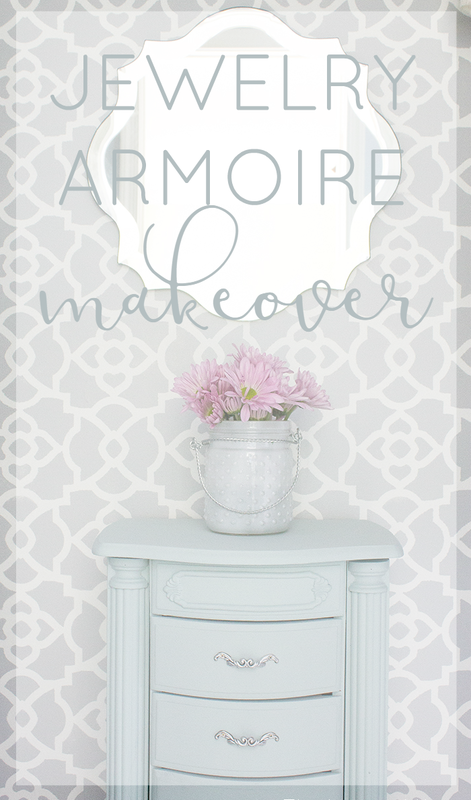 One of the pieces that I really love in my new closet is this jewelry armoire makeover. Thanks to DecoArt for providing paint for this project! This post contains affiliate links for your convenience. Please see my disclosure policy. When I was in college, I painted all of my furniture brown. 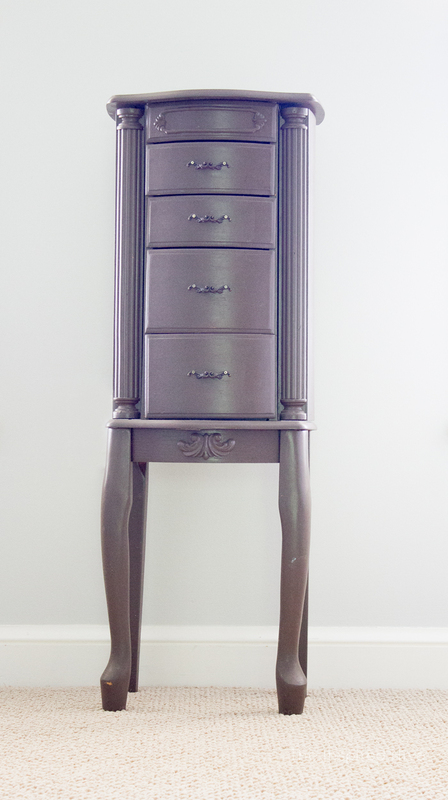 One of the things I painted was the jewelry armoire which was originally purchased at Wal-mart (they currently carry some similar ones). While I loved the brown paint at the time, it doesn't meet my current taste anymore, and if it was going to go in my new pretty closet, it was in serious need of a new look! I had trouble finding hardware that was small enough and would fit the curved shape of the drawers, so I decided to give the existing hardware an update. This was my first experience using Rub n' Buff, and I loved it! 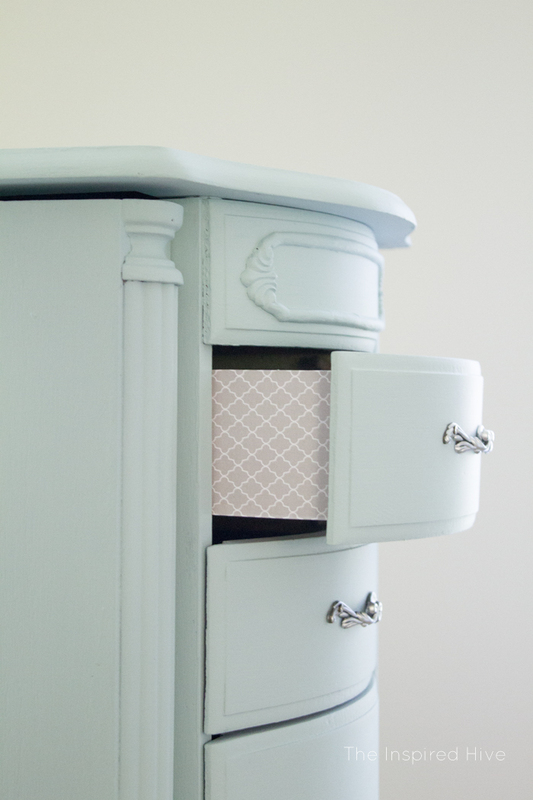 I used a cotton swab to apply it to the drawer pulls, making sure to avoid all of the nooks and crannies in order to get the vintage look from the dark areas. It was smudgy at first, so I had little hope of it holding up, but once it was dry, there was no removing it! I decided that I love this stuff, and I am totally going to use it again! 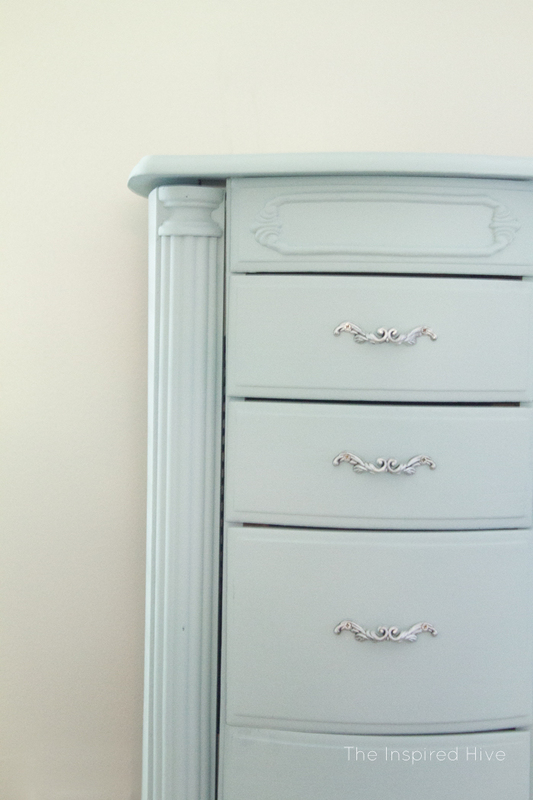 Before reinstalling the hardware, I gave the whole piece of furniture two coats of paints using Americana Decor's Chalky Finish paint in my favorite color. 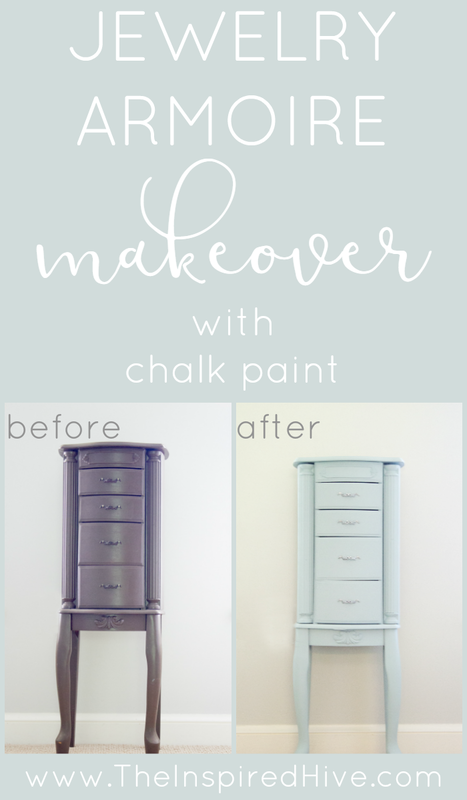 I really love their chalk paint. It goes on smooth, I've never had any issues with chipping, and they have a great range of colors. It only comes in small containers, but I've found that it goes pretty far. 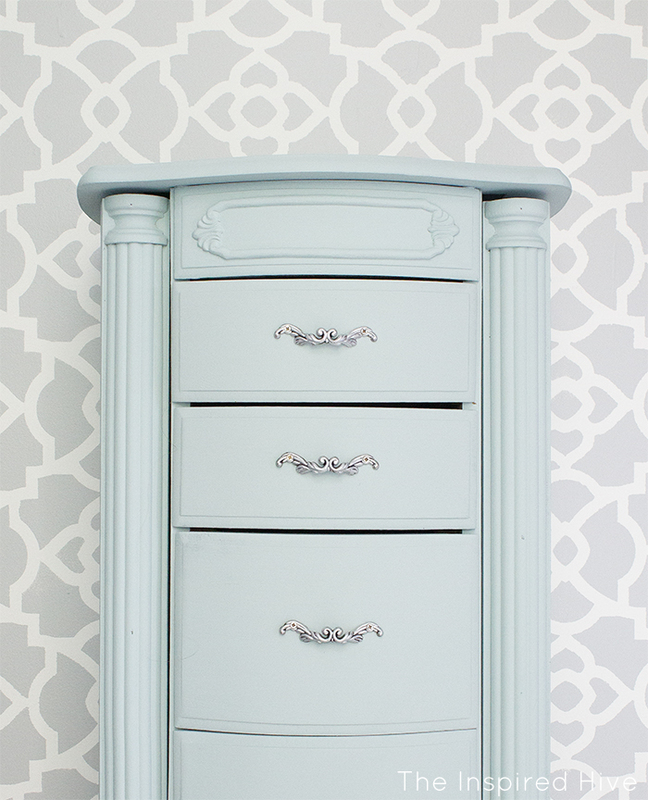 With one 8 oz jar of paint, I painted this jewelry armoire and a dresser for my closet (seen in the closet reveal)! I didn't put any type of top coat on this piece, but if you want to, I really love Americana Decor's Soft Touch Varnish. It dries clear and has a barely there feel. You also don't need to periodically apply it like you do with wax. 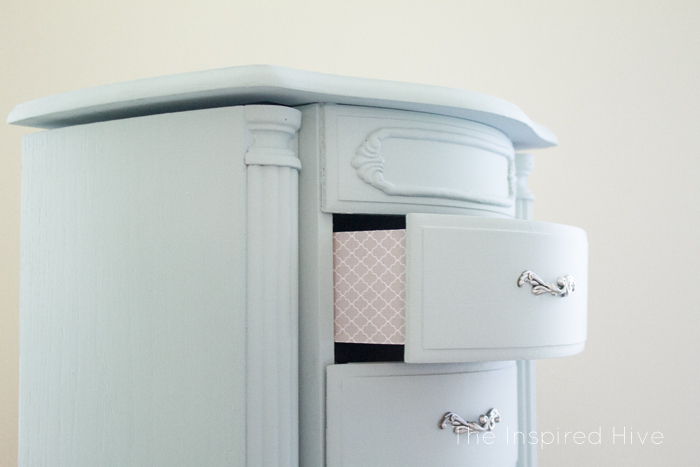 My favorite part of this makeover is the little surprise on the drawer sides. I cut patterned scrapbook paper to fit and used Mod Podge to apply it. I brushed the drawer side with a foam paint brush and Mod Podge, put the paper down on top of it, then applied another coat of Mod Podge. I just love how this little peekaboo detail turned out! I had plans to makeover the inside of the drawers too. 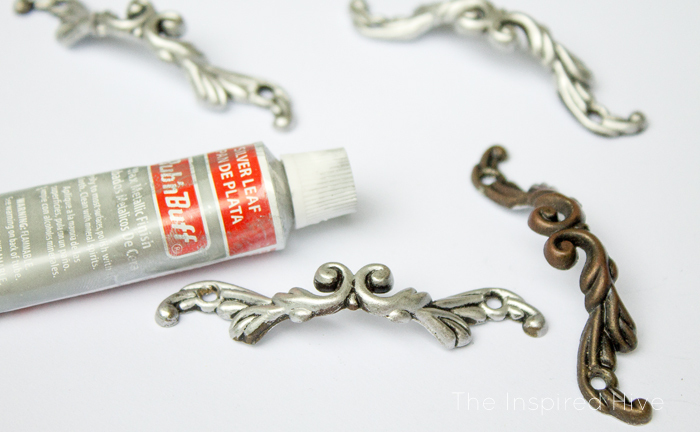 They are lined with ugly green felt, and I wanted to use a fabric medium to paint them a grey color. However, if I'm being totally honest, it did not go well and is not something I want to recommend to my readers. I have added fabric medium to paint before with success, but felt is very absorbant, and I quickly realized it would take lots of paint, many coats, and many days to make it look good. I decided to abort my efforts and plan to reline the drawers with a pretty fabric instead some other time. Overall, I just love how this piece turned out. It works perfectly in my updated closet space. It really pops against the stencil wall! Here's a little glimpse of how it looks in the closet, but you may also want to check out the full closet reveal! Oh my goodness, it looks like a brand new piece! LOVE the colour!